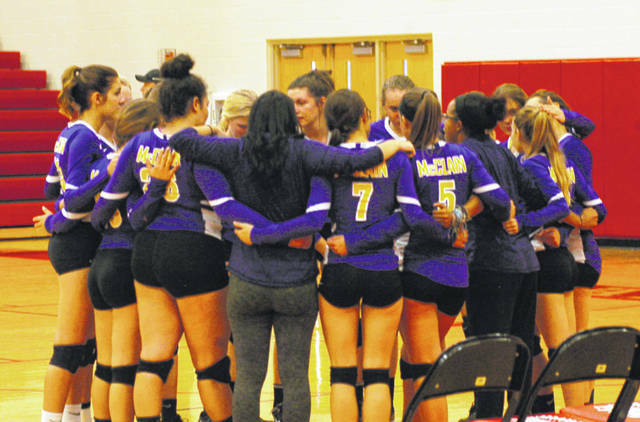 The McClain Lady Tigers volleyball team huddles at Hillsboro High School during the second set of their FAC volleyball match against the Lady Indians. Hillsboro’s Hope Middleton (left) looks on as her serve sails over the net Tuesday at Hillsboro High School where the Lady Indians battled the Lady Tigers in FAC volleyball action. 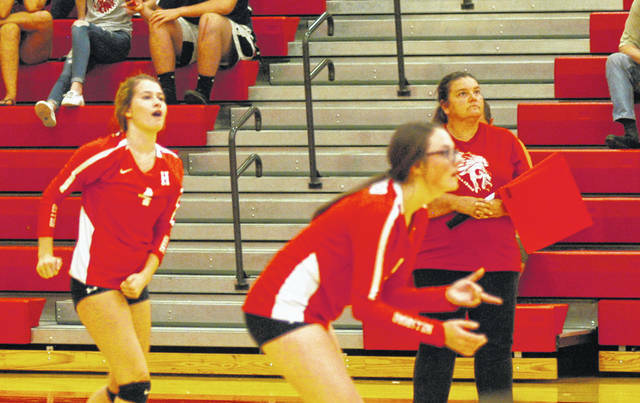 The Hillsboro Lady Indians volleyball team hosted the McClain Lady Tigers on Tuesday in Frontier Athletic Conference volleyball action and lost in straight sets 25-14, 26-24 and 25-22. The first set of the match saw the Lady Indians fall behind early before fighting back to tie the score at five. From there Hillsboro built a narrow 9-6 lead as both teams struggled to keep service on their side of the net. Jaelyn Pitzer took over service for the Lady Tigers with the score at 9-7 and reeled off seven consecutive service points, including four ace, to give McClain the lead 14-9. The Lady Tigers turned up the pressure as they allowed the Lady Indians to record five more points in the set. Makenzie Montavon stepped behind the line for McClain with the scoreboard reading 20-14 and recorded the final five points of the set for the Lady Tigers. Pitzer had three kills in the final sequence for McClain and Montavon ended the set in style as she served an ace to clinch. Hillsboro came alive to start the second set as they quickly built a 15-9 lead over the Lady Tigers. McClain battled back following consecutive missed serves by the Lady Indians and got the score to 17-16 and forced Hillsboro to call timeout and regroup. After breaking the serve of McClain’s Taylor Butterbaugh the Lady Indians missed on their own serve and the game was tied at 18. Cierra Bolender took control of the McClain service game and led the Lady Tigers to four straight points and a 22-18 lead before Hillsboro knew what had hit them. Katie Condo and Sydney Bobbitt combined for four service points on the ensuing two possessions for the Lady Indians as they fought back and tied the set a 24 points apiece. But Montavon refused to let the Lady Tigers lose and recorded the set winning point after McClain broke the serve of Hillsboro. McClain jumped out to a 6-0 lead in the third set as Butterbaugh served to open the set and led the Lady Tigers on a run before Hillsboro could answer. The Lady Tigers continued their strong play, despite a timeout by the Lady Indians, built a 15-8 lead before a service break by the Lady Indians and a missed serve by McClain changed the complexion of the set. Hillsboro’s Hope Middleton stepped behind the line following the mistake by the Lady Tigers and reeled off five straight service points including two aces. Following their own service break and subsequent missed serve by Hillsboro’s Abby Brown Bolender recorded three consecutive service points to give McClain a 21-17 lead. The Indians were unwilling to go quietly into the night as Bobbitt got them to within two points at 22-20 and the Lady Indians made McClain earn the win by not allowing a service point until Macie Adams stepped behind the line and recorded the game winner. The loss drops the Lady Indians to 4-9 on the season, they will be back in action on Thursday when they travel to Washington Court House to take on the Lady Blue Lions in FAC action. McClain improves to 8-7 overall on the season and will be back on the court on Thursday when they host the Ironladies of Jackson in another FAC matchup.